ANCIENT ROOTS: This yew tree in the churchyard of a parish church in central Somerset could be hundreds of years old. They grow bigger in churchyards which are effectively protective enclosures. BIBLICAL LINKS: The sculpture highlights the sycamore destroyed in the Twin Towers attack and right the Cedar (Tree of Hope) is placed in the area where they sycamore once stood in 2003. The tree died in August 2014 and wasn’t replaced. DOES the conifer tree have spiritual significance to our past heritage and is it linked to events around us? If you drive along the countryside, pull over to see a parish church and its churchyard, you will notice that more often than not it will have a yew tree somewhere in its grounds. Just passing it, you wouldn’t think anything of it but there is quite a lot to it. Anyone following this blog will know that back in April I visited some Neolithic monuments with some friends on a long day out in Wiltshire and east Dorset and this was brought to my attention by my travelling companions Dave and Amy. According to the site of the Ancient Yew, in the northern temperate zone of Western society, Celtic, Nordic and Anglo-Saxon ancient cultures linked the yew tree with eternal life, death and re-birth. Local customs and rural traditions can be traced back to these ancient concepts. When the yews were planted in churchyards, the traditions were blended with these ancient roots and whilst remaining as a symbol of eternity, the terminology changed from ‘rebirth’ to ‘resurrection’. In ancient druidic Britain the yew was seen as a kind of “protector of the soul” and was conceived as part of the “natural law of reincarnation” The yew is seen as a symbol of the regenerative power of nature. Dorset, Somerset and the New Forest will have lost much of its yew population to the early medieval longbow production. 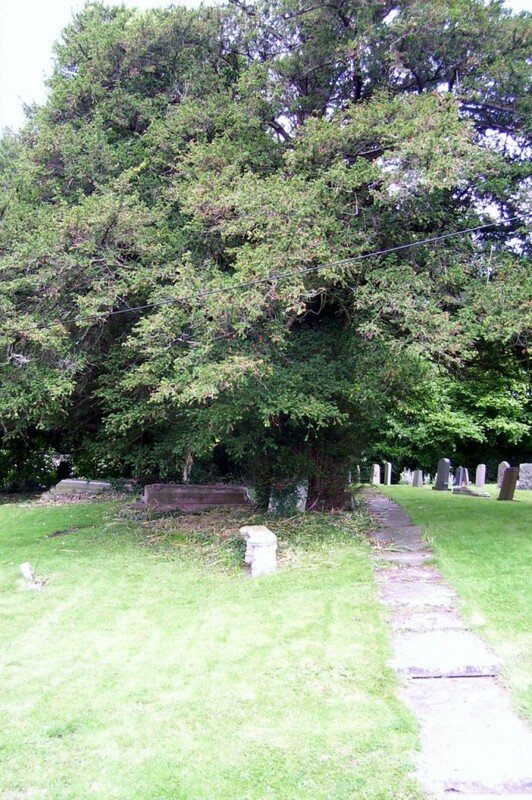 Yews grow bigger in churchyards than in woodland as they have protective enclosures. The Yew was considered as part of a sanctuary – you only have to look at the yew sanctuary in Uppsala, Sweden and the yews in Buddhist temples and Shinto shrines in Japan. As well as finding them in burial sites in the UK, you can also find them in a similar format in France, Germany, Russia, Poland, France and Spain. There are also links to kingship and royalty in Ireland, Russia and Japan. A writer in the Gentleman’s Magazine in 1781 wrote the following: “We read in the antiquities of Greece and Rome that the branches of the cypress and the yew were the usual signals to denote a house in mourning. “Now, sir, as death was a deity amongst the atients (the daughters of Sleep and Night), and by them was represented in the same matter. With the addition of a long robe embroidered with stars. Trees can also have a significant meaning in times of real tragedy. Does anyone remember the Twin Towers attack of 11 September 2001. We are closing in on the 14th anniversary of that world-changing event. 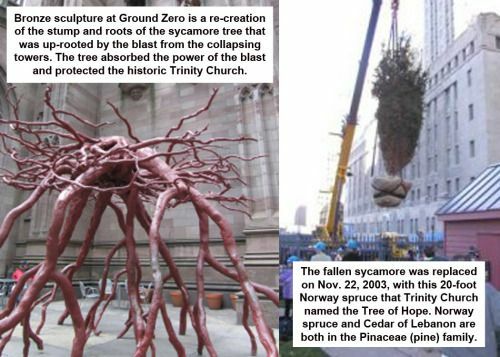 Shortly after the second anniversary of 9/11 on 29 November 2003, a 21-foot spruce (cedar tree) replaced the sycamore tree that originally stood in front of St Paul’s Chapel at Ground Zero. It was called the Tree of Hope. The Ground Zero ceremony declared that “Tree of Hope” will be a sign of indomitable nature of human hope” and seemed to infer that the United States would come back even stronger through its own strength. It was planted in the very place where its 60-year-old sycamore predecessor had been. The sycamore was said to have been a sycamore-fig or fig mulberry that was native to the Middle East and East Africa. 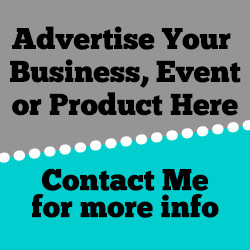 Why refer to this? Well the Tree of Hope mentioned above passed away in August of last year and was replaced quietly without anyone seemingly questioning the significance of this. In light of what was said above, why was this verse in scripture chosen above all others in the Bible said in this speech? I ask this question. Did Senator Daschle have any idea of the words he was using and what they conveyed? Was a vow being fulfilled? Apparently in 1789 the St Paul’s Chapel mentioned earlier in this piece George Washington was inaugurated as president of the United States in New York, not Washington. After delivering his presidential address, he led a procession of Senators and House of Representatives from the streets of the capital from Federal Hall to St Paul’s Chapel. It was alleged that the representatives that day “prayed” for the country for two hours and dedicated the country to God. These facts are being revealed with the question being asked, is there a higher force at work that can’t be explained? If the ‘Tree of Hope’ was dedicated to the world doing everything in its own strength, is that why it died? I only ask this question as we approach the anniversary of this event. How can we get the lightness back out of the darkness enveloping the world today? I throw the question open. Does this explain it?